and a bit of Reflecting on my Childhood. You see January is NOT my favorite month. Here's why....it rained, snowed, blowed dirt, and ruined every Birthday Party my Mama planned for Me. I am a Fair Weather Fan, and if I'd had my druthers, I'd have picked April, May, June or July for a Birthday! Why I wouldn't even mind being April, May or June instead of Sue...at least I'm not named January! 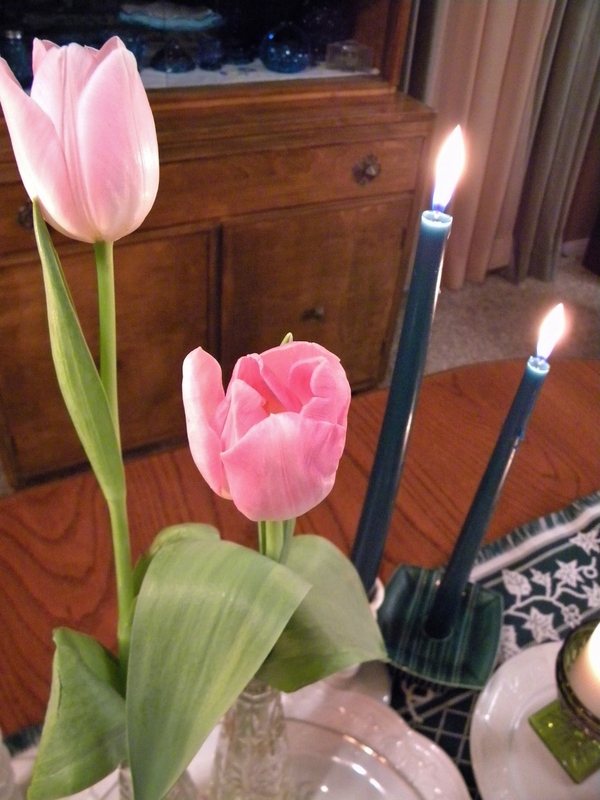 I always associate Tulips with early Spring, Dutch WindMills and the color Red, and I've never given them a thought as a January Fresh Flower. In fact the only Fresh Flower I associate with January is the Carnation. It's the Month of Januarys Flower. Garnet is the Birthstone...I wouldn't have minded being named Garnet. Birthdays? yes, in a general way...for the most, if not for the best of men...(and women)...You were born (I suppose) on a certain day: So was I: or perhaps in the night: what then? That's It!!! The reason....I was Born At Night In A Snow Storm! Oh Goodie...now I have a January BirthNight to look forward to...I hope it Snows! As Always, Thanks Beverly for Making Saturdays Pink!!! PS...By Popular Request, The Rosebud Napkin Folding Tutorial is Posted Below this Pink Saturday Post. I've always admired that dish pattern. Thirty years ago, we had our first baby in January. It's a good month for beginnings. 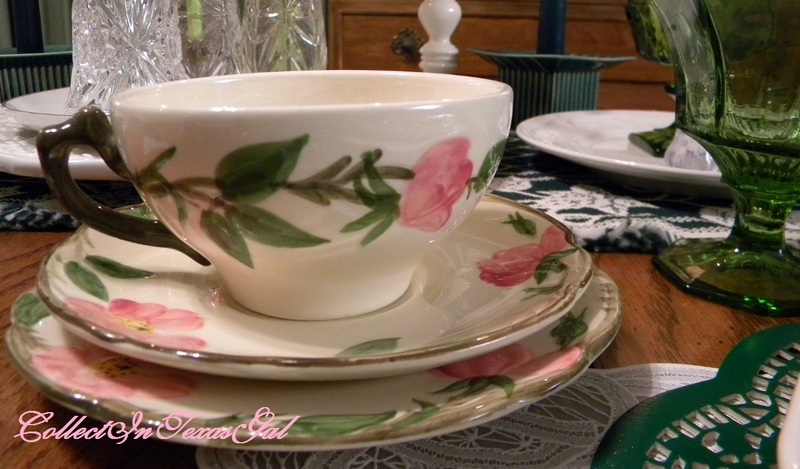 I love the Desert Rose pattern, what a wonderful classic! 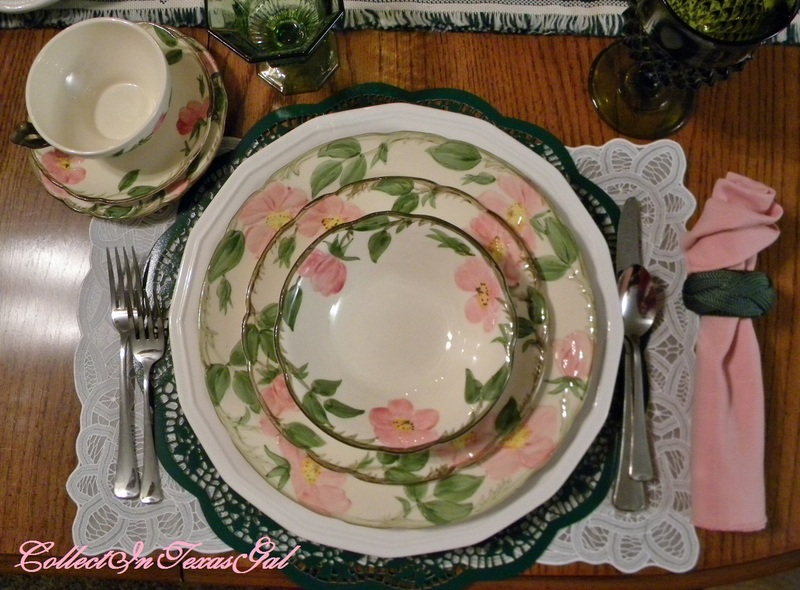 Beautiful table setting for sure! Beautiful as usual. 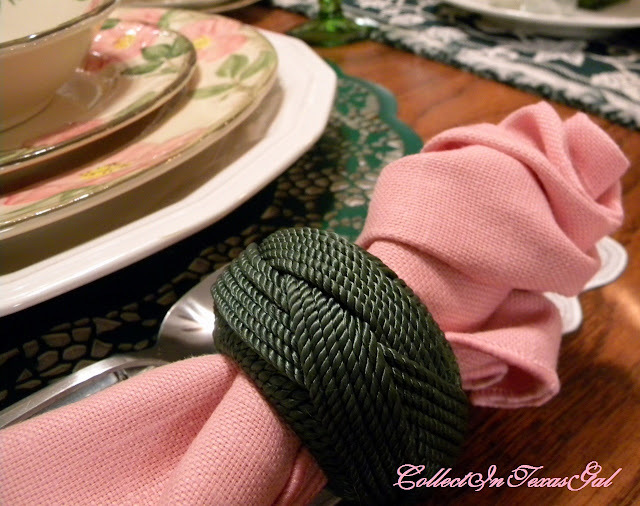 I hope to have your tablescape skills some day!!! :) Happy Birthday Month!! and Happy Pink Saturday...hope to get back to that soon!! Love the pattern - a dear friend had that pattern. Happy January Birthday. I agree it's a wonderful way to begin the new year. We have 3 January Birthdays in this group. 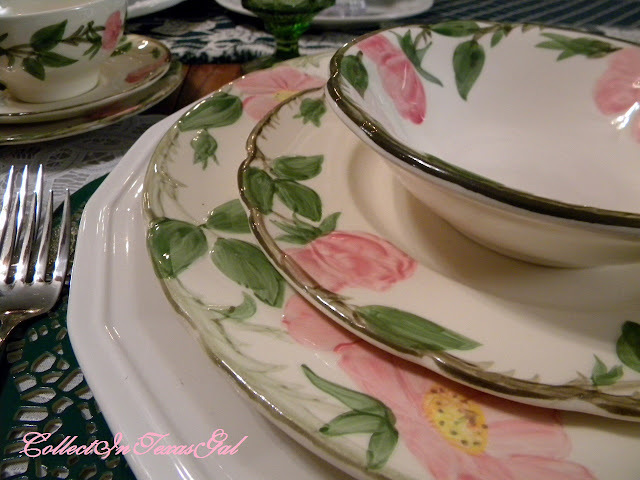 I adore this dish pattern. Beautiful tablescape. Such a beautiful table and your pink tulips really do invite the spring feeling into your dining room. What a beautiful table. I'd love to sit at it on a gloomy January day - it would lift spirits, I think! The Desert Rose pattern is difficult to find up here. I have a dear friend who collects it and I always look for odd pieces when we visit south of the border. She'd love a look at your table! I've always liked that pattern-a true classic! Happy January Birthday! I have to admit that January is not my favorite month either. My hubby's birthday is the 22nd-at least that is something to look forward too! What a pretty table! Happy Belated Birthday to you too. My mom is a January baby too. At least you weren't born right before Christmas. I think I had one birthday party growing up! Thanks so much for visiting, and for the compliment! Patterned backgrounds would definitely NOT work for your blog. LOVE your headers - it's all your blog needs! Happy PS and hugs from the UK. Franciscan Desert Rose was my "first love" in china. Thanks for the reminder. I have snooped around in your blog...You are a very talented lady! A Texas Gal, and from San Angelo, no less. I know a lot of gals and guys from San Angelo. Will be watching for your future posts and have just become your latest follower. 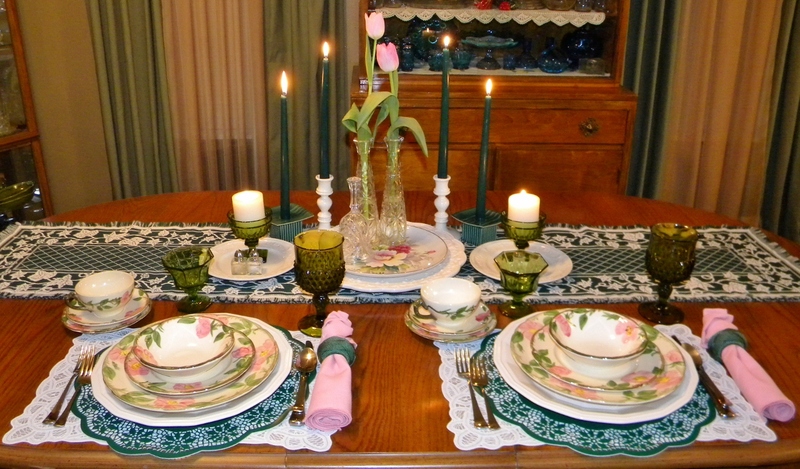 Your table setting is very welcoming, would you set another place, please. Chuckle. My sister has this set also, Sue ... such a warm & wonderful pattern. Just seeing your pretty dishes makes me feel better. The pattern is one of my favorites. Hey, Sue...a birthday coming? Hope it's a happy one...hope you get some sunshine...we had a piece of a sunny day a while back and I positively teared up with joy. At least the rain is good for the spring flowers. Love your tablescape...I have Franciscan Ivy dishes from about the same era...many times I wish I had chosen Desert Rose. Beautiful post! 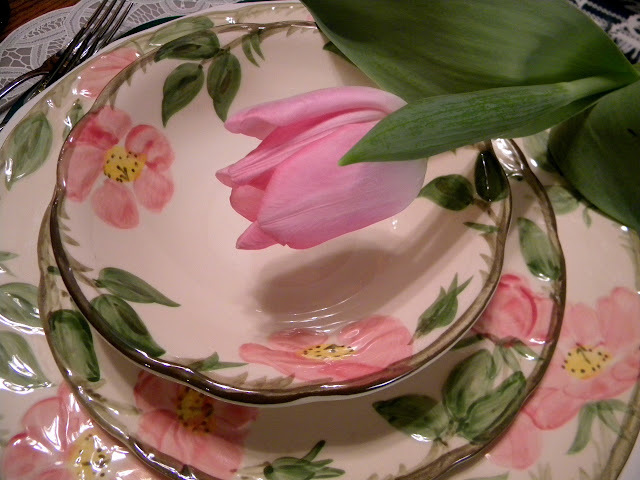 Hi Sue, Your pink Desert Rose dishes are gorgeous. I checked out the tutorial on your previous post and I think I can do this. The napkins look gorgeous. I love the tulips as well. Surprisingly a great flower with the roses. I want to wish you a happy birthday. When is it? Come on fess up. Smile. Thanks for the fun comment about the pink poodle cow. That thing is a hoot. I really can't believe someone might buy it. HA! Happy PS day to you my friend. This is one of my favorite dish patterns. I had a chance to buy a complete set years ago and was too broke at the time to purchase them. I still regret that....but I certainly have other plates now in my collection to more than make up for it. I also love your green glasses that you showed the other day at Linda's party. I noticed that Linda had the same green sherbet glass as well. Enjoy the rest of your weekend. Beautiful table. I love those tulips. Sort of shouts "Spring is coming"! My son's birthday is in February and I'm as equally unexcited about that. I always have great ideas for parties in the summer, but a winter Birthday party is sort of boring. Hope you had a good one.